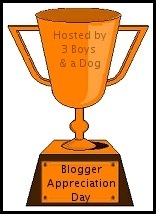 Kelly over at 3BoysandaDog has an inspiring event going on in her Giveaway and Product Reviews blog she calls Blogger Appreciation Day. She is asking bloggers to write a post about and link to the ten bloggers that referred them the most traffic over the previous month. Blogger Appreciation Day – the perfect way to support the other bloggers who support you. This edition coincides with the second birthday of this blog. I am usually so focused on writing and networking that I don’t look at analytics very often. Annually is a good time to check in and see where you are. Kelly is offering a free month of ad space to a winner chosen from all the blogs that participate. Even if you don’t, do visit her blog and check out how the cool Linky Tools she uses works. CommentLuv 55 visitors – How CommentLuv works – How CommentLuv Grows Blogs and Businesses. Kikolani 51 visitors Thanks Kristi – if you are a blogger and don’t read her posts regularly you are really missing out. Great Blogging Tips plus how to promote your blog using Social Media. Kristi also writes for Search Engine Journal, Famous Bloggers, Social Media Examiner, Search Engine Watch, and Stay on Search. SprawnyMarketing.pl – 48 visitors – I hope they see this link and contact me. I assume some of their readers read English; if they (or anyone else) would like to translate any of my content for readers whose native language is not English contact me. BloggerLuv – 33 visitors – Follow BloggerLuv on Twitter – BloggerLuv is a rockin’ blogging community. The Blog About Everything – Thanks Danny – 18 visitors probably most from the Does DoFollow Hurt PageRank debate. Tech-Link Blog – 17 visitors – Thanks Paul – Check out his Cricket Cell Phone reviews before you buy another phone. AffiliateXFiles Affiliate Marketing Blog – 16 visitors – Thanks Ron – If you want to know anything about Affiliate Marketing ask him. No one does article marketing as well as he does. Ron has been doing an entire series on Facebook Marketing that may interest many. Thank you to the bloggers above and all the other bloggers who read GrowMap, link to my content, or approve my comments. Without you GrowMap would not have achieved what it has. While focusing on publishing posts daily is a good idea, interacting with your readers in the comments and promoting your posts across Social Networks are also necessary. Finding the balance and getting processes in place to keep all the plates spinning is a challenge I am continually working to improve. This year I spent a lot of time promoting the efforts of others and doing what is best for all. That is currently a higher priority than my own blog. As the processes come together posting here more regularly will happen. As you can see, comments boomed here. That is a great indication that my readers are interested in specific content and have much to contribute. Thank you to every person who comments here – you add so much more to every discussion. Comments take a ton of time to manage well. I prefer to answer every comment because my readers deserve to be heard and acknowledged. That is not always possible in as timely a manner as I wish, but I do answer as many comments as quickly as I can. I do not feel we can get a clear picture from subscriber numbers. Many people don’t actually read what they subscribe to, some read newsletters if you have one, others subscribe to comments and come back that way. I recently came across a tool that tells you which Twitter followers are interacting and which are broadcasting. I’ve been pondering whether to unfollow those who don’t actually communicate on Twitter; however, for now I believe seeing the content they share is too important to me to give up. With the introduction of Twitter lists there is no reason to limit Twitter followers because we can easily zero in on those we interact with most. Congrats on 2 great years! This has been a wonderful resource that I have used to grow my business over the last year. The ideas and business building strategies that I have come across on your site are better than some information I have paid a great deal for! Thanks for keeping your readers happy and informed. I wish you massive success in the future! Thank you for your wonderful comment. I am revisiting this post because today is the third birthday of GrowMap. My apologies for not replying to you sooner. It has been an amazingly busy year as I will explain in the post I’m working on now. If I can ever be of assistance or answer any questions please do not hesitate to connect with me. The best methods are explained on my contact tab. Happy anniversary GrowMap! May you have many more years and more quality and informative blog posts to come! It’s time for celebration! Congratulations on your success and I wish you well. I’m looking forward to see more successful years to come for you. Well, it seems like you are totally blown away at other reader feedback. Keep it up! The Jack Russells I’ve seen had plenty of agility and even more energy so I’m guessing that is a type of performance? If they could train chihuahuas now that would be something. Strange little dogs. You definitely give to others and help people out. You’ve given me a lot of good advice and attention, and I really appreciate it. It looks like you’re trying to learn how to make money online the hard way. Join us in the collaborations explained in the post I’ll feature in CommentLuv in this reply. You have a great site here. I’m really interested in reading more. You may want to check out Jarret’s supplements, health habits and multi-author health blogs. Hey Gail, happy birthday for your blog! Those are some very impressive subscriber stats. My blog started on WordPress dot com. Even after three years including on that domain, I’ve only accumulated about 120 Feedburner subscribers. Do you find most of your subscribers are for RSS or do you still get a fair amount of email subscriptions? The main reason for my subscriber numbers is that I was very active on FriendFeed back before it was absorbed. When Google bought out FeedBlitz they added FriendFeed subscribers to RSS subscribers (because you actully see the feed there). The problem with RSS numbers is that high numbers don’t necessarily mean that your subscribers are reading your posts. I believe email subscriptions are going to be more popular and soon people will be more likely to read your posts via Social Media. The FeedBurner alternative FeedBlitz already allows subscribers to receive posts via Twitter, Facebook or Instant Messenger. If you want to see their sign-up form try it on our NoBogies Golf Blog. A key component of gaining subscribers is to do what we are doing in that blog that I still need to add to this one: offer an incentive – something useful, usually a download to encourage visitors to subscribe – and start building a list you will connect with regularly. I have known since the mid-1990s that “the money is in your list” and I still don’t do it. Don’t do as I do – be wise and start building a list and using it wisely. congratulation! I am a big fan of this blog and i have learned a lot from this blog.Really a great blog. Congrats on the milestone… Here’s to hoping that there will be many more similar celebrations. keep up the good work! I’m not planning to stop blogging any time soon. 🙂 If the Superior Promos promotional products site is yours I would like to talk to you about collaborating with us. We have a Gift Ideas blog to promote engraved gifts store that does not sell promotional products. Working together would be mutually beneficial. You are welcome to use your name AND keywords in the name field here. Read how in the post I’ll use in CommentLuv in this reply. You’ve accomplished a whole lot in these two years. I’m really glad you contribute to the blogging community and keep people informed about the many advantages of helping other people – specifically of why it’s better to be do follow. I have been thinking about writing a report about why it’s good to be do follow but haven’t had the time yet. It’s a report that is close to my heart. Many bloggers are scared to be do follow because they are misinformed. On another note, I also make it a point to answer my commenters. However it really is a lot of work. Sometimes I even take weeks to get around to answering but life gets in the way. In the end I always answer. I think it’s the whole – do unto others as you would have them do unto you. If someone talks to me I need to acknowledge them in some way. That’s what Jesus would do. In relation to my twitter followers, once I’ve decided to follow someone I don’t unfollow them. I can’t keep up with everyone so I watch what’s going on through lists. I think unfollowing people hurts their feelings and I don’t want anyone to be hurt. I know that if someone unfollows me I feel a bit hurt that’s why I’m saying this. Congratulations on your 2 years anniversary- wishing you all the best! .-= Eren@ baby shower themes´s featured blog ..Monkey Theme Baby Shower =-. Some of the people who like to claim that dofollow hurts PageRank or link juice or whatever are simply selfish. We would do it even if it did hurt us (which I don’t believe is true – at least not at this time) because it is the right thing to do. I do unfollow some people who have never followed me back when I need the space but only because of Twitter’s silly follower ratio rule. You are correct that many people are very concerned when someone unfollows them and they think it means they did something wrong. I would love to collaborate more closely with you if you’re interested and one of my most trusted collaborators has a baby shower blog that is closely related to yours. We have been looking for a JV partner for his site. Contact me if you would like me to introduce you to Ron. He is the very best article marketer I have ever seen or heard about and working with him would definitely be an enormous benefit to you. you have created growmap definitely a great blog. .-= zoul´s featured blog ..Aku Terjumpa Orang Buang Bayi =-. If you or anyone you know is ever interested in paid work please do let me know. I will have more and more work available as time goes on. Congrats on your high numbers, you’re obviously interacting with your followers and they’re coming back in their droves! Well done! Thank you, Matt. I hope you’ll be back too. There are more details about that in the post I’ll feature in CommentLuv in this reply. Thanks for Linky Tools link. Will follow on you on Twitter. I know of bloggers who don’t last two weeks let alone two years. Keep up the good work. .-= Anthony Lloyd´s featured blog ..Dear Broadband Soup- Leave Al Gore Alone! =-. Glad you like it. Your post Steve Jobs tickles me every time I see it. We often get businesses asking about tech and gadget blogs so they’re likely to have opportunities. If you want to be notified about them please join our blog collaboration. Wow! Congratulations and Happy Birthday! This is the most wonderful day for you – with lots of achievements…Make the most out of this day.Carpe Diem! Thank you. Would you ask Hooks and Lattice if they would be interested in collaborating with me between their site and Good Millwork? I also know many real estate related bloggers who would be a good fit for them. Read more about our private Blog Collaboration and let me know if you or any bloggers you know are interested. i am pretty new at the blogging thing. Wanting to provide information, yet also hopefully earn a little affiliate money as well. Not sure if I’m going about it right right way, but you gotta start somewhere. .-= Jackson@surveys for income´s featured blog ..Surveys For Income =-. I see you’ve run into a little setback. Before you work too hard why not check in with us in BloggerLuv and elsewhere. Many of us learned the hard way and assist others so they have it easier than we did. .-= Michelle Mangen @ Your Virtual Assistant´s featured blog ..Are You Treating Your Blog Like This =-. Thank you Michelle. I look forward to working with you much more this year. Would you be interested in doing an interview on Murray Newlands similar to the one that Donna did on eBusiness coaching? .-= Gail´s featured blog ..How to Build a Successful Blog Based Business =-. Great post. I hope you have a very nice blog anniversary!! .-= Derek@LasVegasChiropractor´s featured blog ..Concerns together with If You Have Been Involved In An Vehicle Crash =-. Thank you Derek. Good to see you understand how to use KeywordLuv well. Gail you said on Marks blog competition you would be willing to send us a flyer and other info to help promote local search engine listings. I would be interested in getting access to this opportunity for both my own and other business I have good connections with. Question are some of these search engines limited to USA or also include UK. Some of them are U.S. only and some have U.K. sections as well. I would be happy to work with anyone interested to identify and list which have U.K. sections for the benefit of many others. Ideally we need to list which directories cover which countries as the same question comes up regularly in relation to Australia and other locations. You probably have already seen the information about Local Search Directories you can reach from the link I’ll put in CommentLuv in this reply. Note that post links to other information including a form for collecting the data required to request the listings. .-= Blogging tips´s featured blog ..Stealing Your Content Report them to Adsense in 3 Easy steps =-. Perhaps you would like to join our collaborations? I see you already use CommentLuv. If you or anyone you know is every interested in paid work please contact me. The exchange rate between the U.S. and India is a strong incentive for companies here to hire people there. It is also interesting to see that the number of new subscribers is directly linked to the number of new posts … food for thoughts for those who were still doubting it. Thank you. I do update those lists as time allows. I highly recommend you also visit Kristi Hine’s Kikolani Social Media and Blogging Tips blog and her DoFollow site. You’ll find many more there. Ideally we should post at least five days a week (either once a day on weekdays or once a day six or seven days of the week). I don’t always do that here because I have other priorities that cause me to run out of time before I get to it. You can also read my posts at Murray Newlands Internet Social Media Marketing blog, Inbound Marketing blog and Word of Mouth Marketing blog. Hey Gail, Congrats on your blog’s anniversary. There will certainly be much more success ahead of you with many more years to come. .-= Danny @ Blogs about everything´s featured blog ..The Power of Focus =-. Thanks Danny. I have no doubt we will have much more going on very soon as I continue to work toward collaborating more effectively. Did you notice there are new real estate blogs joining our blogging collaboration? Have you met them yet? Gail, congratulations on your blog’s 2nd anniversary. Your growth is well deserved. I’d like to share my thoughts on the Twitter tool you discovered. The tweetstream is aptly named. Like a river filled with 140-foot boats, Twitter always has something flowing in it. Imagine you are on the shore, watching the yachts, sailboats and other craft. You don’t really pay too much attention to them because the go by so quickly. Now imagine you own one of the yachts. As you navigate, you’re paying more attention, since you don’t want to annoy your fellow sailors by approaching too closely, or speeding by so fast that you splash them with your wake. Disclaimer: I also don’t bother to delete temp files from my hard drive, if you get my drift LOL! Thank you so much for taking the time to comment. Like you, I focus on communicators and haven’t seen much point it taking the time to unfollow broadcasters. What they share sometimes hits my radar and is useful to me or worth RTing. I love your analogy. People love stories and bloggers who can weave them well are far more interesting to read. I look forward to reading more of yours. In the past month, just under 50% of my traffic came from organic search with keywords related to KeywordLuv being the most popular searches. Twitter was 7th, Bing was 9th and TwitterFeed was 11th. If you want some other specific details let me know. .-= sangsang´s featured blog ..Bí m?t t?o ra s? khác bi?t trong bán hàng =-. If there are ever any questions I can assist you with please do not hesitate to ask. .-= Colleen@Kennewick Homes´s featured blog ..Canyon’s Edge Winery Holding Meet the Artist and Concert =-. This blog sometimes loses out to higher priority projects but I do try to keep it growing. This next year what will be accomplished by bloggers collaborating with each other will be amazing. I am glad you’ll be part of where we’re all going. .-= C5@Jewelry Crafting´s featured blog ..Jewelry Crafting =-. Welcome C5 and thank you. There is always more to do than time to do it and priorities to be selected. If you will join us in our collaborations you can improve and grow much faster. Hey Gail, congratulations and happy anniversary. I just celebrated 1 year back in July. It’s exciting to see how your blog has progressed and very inspiring. Really great to see that BloggerLuv is sending so much traffic your way too. The community is very supportive and I think it’s #1 on my incoming traffic list. I think this is a great post idea that I should try. The work you do is really appreciated too. Thanks! .-= Ileane@Basic Blog Tips´s featured blog ..John Sullivan likes Karens activity =-. What you have accomplished in only a year is very impressive. I would love to collaborate with you more closely and increase what I do to promote your work. Contact me at your convenience? Yeah! Congrats on 2 years. I’m very glad to have recently come across this site and it’s an outstanding resource. Yesterday I put the Guitar Guy video on my Facebook! Keep up all the great work and all the helpful blog posts. Your messages are very, very helpful. Thank you Jeff. I am happy to have you as a regular reader. If you ever have any specific questions just ask. I have vast amounts of research and links that I haven’t had time to publish here or on other blogs I manage. It is very likely I have just what you might want to know already researched or know who does. If you would like to be interviewed for MurrayNewlands.com or write guest posts for any of the many marketing related blogs I manage content on please do let me know. Is it true that you have associated yourself with Linda Christas College? .-= Jon Awbrey´s featured blog ..Titoism and Totalitarianism =-. Yes, Jon, it is. Although it is not as obvious from their site as I would prefer, I am impressed by both their ethics and what they have to offer. I will be writing more about them from various platforms as soon as time allows and explain why I recommend them as an alternative to the sorry state of public education. One of the major actions I plan to take is to encourage those who have the resources to support scholarships for exceptional students who can not afford high quality educations on their own. I know you have worked very hard and you have created a fabulous resource for us all to use! Thank you for taking time to comment, Murray. I know you’re probably still recovering from getting home from Affiliate Summit. I hope anyone who wanted to attend or was there will check out the Affiliate Summit East 2010 Link Roundup. Way to go, Gail. Keep up the good work! Thank you Matt. Always happy to hear from you. I am still looking for a way to whitelist my regular commentators in hopes of getting their comments to go live immediately – or if we can’t make that happen because of how WordPress works – at least put them in a separate section for faster moderation. Would you believe I’m getting 1000s of spam comments now? The backlog is daunting. Gail, hearty congrats on your two-year anniversary. .-= John Soares @ California Hiking Trails´s featured blog ..East Bay Regional Park District Reception Living Landscape Book Signing =-. Have you added all your blogs to the Blogs by Niche section in our Blog Collaboration? If you need more niches let me know – or if you like I can upgrade you to moderator status so you can add them yourself. The how-to instructions are already written up in the forum. .-= Truong´s featured blog ..40 Useful jQuery Techniques and Plugins =-. Come by any time. It looks like you are have a programming content on your blog. You may want to target suitable keywords when you comment here as explained in the post I’ll link to this reply. I see you already use CommentLuv. Consider joining our blogging collaborations at BloggerLuv and SBC to meet more bloggers interested in what you write. Thank you SQL. I hope you’ll drop by often. Congratulations on completing your second year of GrowMap! Thank you Nabeel.are you in our collaboration? Would you like to be? Congrats for your remarkable achievement. Thank you. Do be sure to read the post I’ll put in CommentLuv in this reply. I wrote a positive review for the only computer repair tech around here who does Ubuntu and now if anyone searches Yahoo Local for Ubuntu in all of Dallas they show up. You can do the same for your own business by optimizing your Local Search Directory listings. There is tons of information about how in the post I’ll put in CommentLuv in this reply. I read somewhere the other day that bloggers should take more time out from writing content and interact more with those who comment. This promotes online Social networking and helps with building your credibility. You don’t get to see the face behind the words most of the time. The blog owner personally commenting or answering a blog post comment provides a sense that there is someone real behind the words. A lot of the time that is the best you can do from an online perspective and it goes a long way. Congrats on your 2nd anniversary and this gives me the idea to make sure I check my analytics more closely as well and thank those that visit my site. .-= Doug Taylor´s featured blog ..My Online Business Strategy The Stone Cold Facts! =-. It is always a challenge to balance writing new content, answering comments, and being active across Social Networking sites, group blogs, in blogging communities, etc. due to limited time. I don’t know that anyone has got the balance down just right yet but we’re moving in that direction. There are so many more things we can all do: look at analytics, connect with those who link to us, join collaborations. I guess all we can do is all we can do. Happy Birthday! And Many more blog-o-versaries to come! Personally, I’ve stopped following on Year 3 of my own blog and actually forgot the blog-o-versary entirely on Year 5! Not because I don’t think it’s a big deal or anything .. but mostly it reminds me that I’m still as crazy as I’ll every be! .-= HART (1-800-HART)´s featured blog ..Luckiest People On Earth =-. I appreciate your input on item 4. Thanks. I would love to see you join our private blog collaborations as I want to know more about what your goals are and what you have going on. I know you’re on BloggerLuv but don’t recall seeing you in SBC. Congratulations on your 2nd birthday Growmap!!! My friend introduced this blog to me a few weeks ago. I told her I was interested to make my own blog. She is an intense Intenet surfer so she recommended this blog to me. Well, congrats and I’m going to hang around here from now on… Kudos!!! .-= Icy for North Carolina Traffic Violation´s featured blog ..Hello world! =-. Glad to have you aboard. The fastest way to learn blogging best practices is to join our collaborations. There are many of us who are happy to assist new bloggers and what we share at BloggerLuv and SBC will save you a ton of time and money. You can read more about it in the post I’ll put in CommentLuv in this reply and also in a similar post at BloggerLuv. Congrats to you and for more years to come! 🙂 Stats are very important but interaction with people matter too as you’ve noticed. The examples of twitters that only broadcast is common. I only have lists for people that care and follow them in my twitter application to avoid noise. .-= Gera @ Sweets Foods Blog´s featured blog ..Blogging Tips- Social Media Resources- Foodies – Best of the Week =-. Congratulations on two years of amazing growth. You always have such valuable information on here. I agree less content and more interaction is the recipe that works for you. Your comments section is always packed full of additional information and discussion. I read much more than I comment, and have learned a great deal from you. Thanks. .-= Melinda´s featured blog ..Cool Find Friday 7 =-. Big congratulations on making it to the 2 year mark. May this blog see many more seasons! .-= DazzlinDonna@eBusiness Consultant´s featured blog ..niche research =-. Congratulations Growmap on reachingyour 2nd birthday. This blog has been one of my best finds in the blogosphere. As a newbie blogger, not only am I learning heaps here; I have been introduced to heaps more bloggers and joined the blogging comminity which I so enjoy. Your generosity in supporting small businesses knows no bounds and I for one am grateful that I have bumped into you and now I hope to establish myself in my chosen niche and help others as you do. .-= Patricia@lavenderuses.com ´s featured blog ..Lavender Health-Embracing An Organic Lifestyle =-. Thank you for your comment and joining us in creating a better world. Blogging reminds me of racquetball: some people learn quickly and improve continually and others stay beginners forever. That is why we collaborate: so those with the desire to learn have one-on-one assistance so they don’t have to do it the hard way. Congrats on your remarkable achievement. You have great numbers in term of blog growth and definitely great blog. Congratulations, you know DragonBlogger.com hits its 2 year anniversary on August 23rd 2010, in just 3 days. Our sites started very close together. .-= Justin Germino´s featured blog ..AdSense Earnings Milestone =-. I didn’t know we started so close together. I would love to colalborate with you more closely if you’re interested. Drop me an email? I have so much going on that can benefit you and any other serious blogger. Thank you Imran. I would love to collaborate with you. Have you seen the information about BloggerLuv and our private SBC blog collaboration? Are you familiar with KeywordLuv? Check out the post I’ll feature in CommentLuv in this reply and then you can use those keyword phrases when you comment to build backlinks to your site.